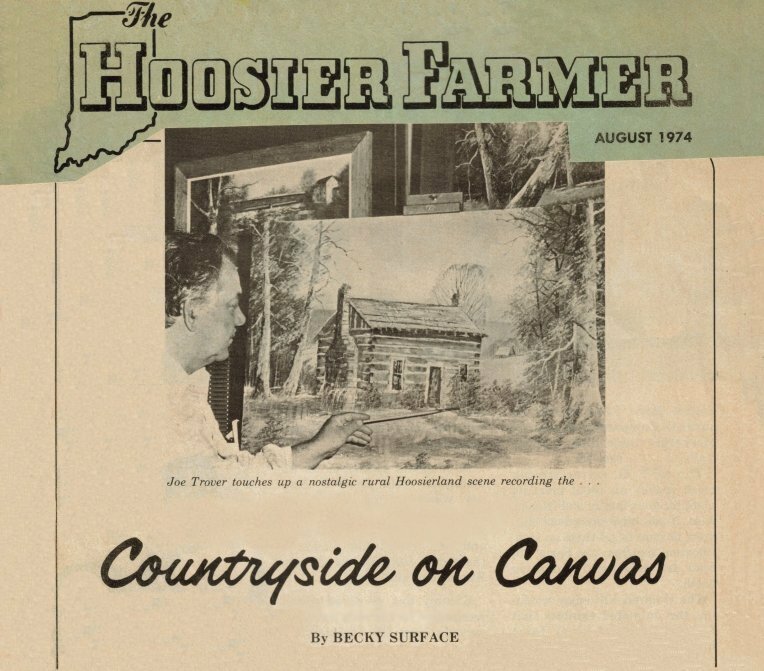 Indiana has some picturesque countryside and one of its native sons has captured many of the colorful and tranquil moods of the Hoosier state with his oil paints and canvas. The Hoosier artist began his art career in Dana, a small town on the western side of the state that proudly boasts of another native son, Ernie Pyle, the famous war correspondent. Joe Trover, who now lives in Indianapolis, was asked by his new bride what he wanted for their first Christmas in 1935. Because he had always enjoyed sketching, his Christmas wish was for the four tubes of oil paint which he had seen at a local variety store. Thus began a career that was to bring pleasure to many who viewed his works of art. When the Trovers moved to Indianapolis. Trover began serious studying with several different instructors. His first paintings were sold to his fellow employees at the factory. About the only free time he had to pursue this hobby was late at night or on weekends. Then, a few years ago, he began directing all his time and energy to serious painting and art became his vocation. Where does an artist get his ideas? What special gifts does an artist have to perceive such interesting patterns of lights and darks, of color and design, and of capturing a mood or feeling on canvas? Trover does most of his paintings with a palate knife and describes them as giving the effect as one "going by and glancing at a scene... not like you were starring at it!" "This way you can see something new each time you look at the painting," he continues. He does admit that some subjects do require a lot of detail while others do not. "Simple subjects require the most detail," he says. Trover says "nature just throws beauty out there... sometimes in an uncontrolled manner. An artist does not have the same advantages that nature has, so he must use some of his own effects." "For example, the colors are constantly changing. Watch when the sun goes behind a cloud or when it sinks low in the sky. Colors change, shadows change." Do artists ever have a "bad day" at the studio just as farmers have bad days in the field or the office worker has a bad day at the office? "Yes, sometimes the picture flows onto the canvas as though it was computer programmed... but other times it is very difficult. I�ve had to quit painting for awhile and hopefully, when I come back later I would see things entirely differently. Then laughingly he adds, "One night I dreamed the bed sheet was a still-wet snow scene and there I was lying in the middle of it!" While Trover has done some traveling and spends part of his winter in the south, he thinks no state is more beautiful than his native Hoosierland. "As I first traveled to other parts of the country, I saw little beauty. But later I began to realize there was beauty everywhere... It was just a different kind of beauty than I was accustomed to seeing." While his favorite countryside is here in Indiana, his favorite season is autumn. "The autumn color in Indiana is unsurpassed." He says. I also enjoy painting snow scenes as there is more depth, distance, and variety in this type of landscape. Trover believes there are more and more people who are becoming interested in painting and who actually try their hand at it. He attributes much of this to the more affluent society in recent years and the increased amount of leisure time most of the people have. More and more people are taking up painting as a hobby or as therapy in coping with a fast-paced world. Many of them have become professional at it. Trover has received several awards for his works of art. Also, he has had several one-man shows in the Hoosier Salon and the Hoosier Hills Art Guild. His beautiful Hoosier landscapes and snowscapes may be found throughout Indiana at various art galleries... Signed with the name "Trover".